The U Street Corridor is an urban neighborhood located in the Northwest Quadrant of Washington, DC. This neighborhood has experienced significant development and revitalization over the past couple of decades. The U Street Corridor neighborhood is bounded by New Hampshire Avenue to the west, Florida Avenue to the north, 6th Street to the west and R Street to the south. 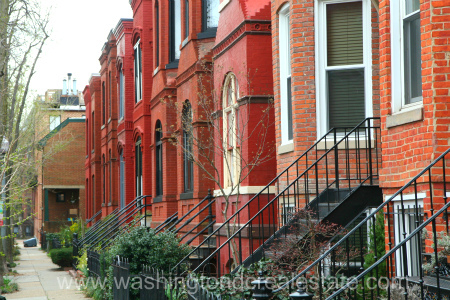 Read more about U Street Corridor real estate. The U Street Corridor neighborhood features a healthy mix of both residential housing as well as businesses and shopping venues. The major streets are lined with shops, nightclubs, art galleries, and a collection of eateries. Originally developed following the Civil War, the neighborhood continued to expand through the early 20th century. Today, the area features a vast array of properties including historic row houses and upscale contemporary condo developments. The U Street Corridor is widely acclaimed as a cultural center for African Americans and in its early years served as the neighborhood of choice for affluent black Washingtonians. Today, residents and visitors can enjoy the historic Lincoln Theater which opened in 1921 or the iconic Howard Theater which opened in 1926. Since the opening of the U Street Metro Station in 1990, more than 2,000 new condo units have been delivered in the U Street neighborhood.